During a recent visit to a customer facility I was asked what kind of samples, and applications I typically see. It would seem that this would be a pretty easy question to answer but I struggled to narrow it down to anything “typical”. Over the past three weeks I have spent a couple of days each week at customer facilities and I think a brief description of each of them will explain why I had a hard time answering the question. The first facility I went to was a university in the process of qualifying an integrated EDS/EBSD system on a combined focused ion beam (FIB) and scanning electron microscope (SEM). A system like this allows one to remove material layer by layer and reconstruct a full 3D model of the sample. The dataset in Figure 1 illustrates why this information can be crucial when calculating material properties based on the grain structure from an EBSD scan. If one looks at the image on the left in the figure, it seems obvious that there are a few large grains in the sample with the area between them filled by smaller grains. However, the reconstructed grain on the right shows that several of these smaller “grains” seen in the single slice are actually interconnected and form a very large grain that stretches outside the probed volume. 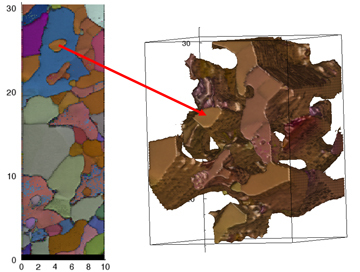 Figure 1: Single slice EBSD map (left) and single reconstructed grain from 3D slice set (right). While we spent a good amount of time documenting exactly what kind of speed, signal-to-noise, resolution and sensitivity we could get out of the system, one of the customer’s goals was to measure strain to use as a basis for material modelling. We also discussed a potential collaboration since our EBSD applications engineer, Shawn Wallace, has access to meteorite samples through his previous position at the American Museum of Natural History in New York and a 3D measurement of the grains in a meteorite could make a very compelling study. Next up was a government agency where the user’s primary interest was in mineral samples but also slag and biological materials retained in mineral matrices. Besides the SEM with EDS they had a microprobe in the next room and they would often investigate the samples in the SEM first before going to the microprobe for detailed analysis (when and if this is required is a different discussion, I would recommend Dale Newbury and Nicholas Ritchie’s article for more details: J Mater Sci (2015) 50:493–518 DOI 10.1007/s10853-014-8685-2). A typical workflow would be to map out an area of the sample and identify the different phases present to calculate the area fraction and total composition. Since the users of the facility work with minerals all the time, they could easily identify the different parts of the sample by looking at the spectra and quantification numbers, but I have a physics background and will readily admit that I would be hard pressed to tell the difference between bustamite and olivine without the help of Google or a reference book. However, this specific system had the spectrum matching option, which eliminates a lot of the digging in books and finding the right composition. The workflow is illustrated in Figure 2, where one starts by collecting a SEM image of the area of interest and, when the EDS map is subsequently collected, the software will automatically identify areas with similar composition and assign colors accordingly. The next step would then be to extract the spectrum from one area and match it up against a database of spectra. As we can see in the spectrum of Figure 2, the red phase of the EDS map corresponds to a obsidian matrix with slightly elevated Na, Al, and Ca contributions relative to the standard. Figure 2: Backscatter electron image (top left) and corresponding phase map (top right) showing different compositions in the sample. The bottom spectrum corresponds to the red phase and has an obsidian spectrum overlaid. The last facility I visited was a forensic lab, where they had purchased an EDS system primarily for gunshot residue (GSR) detection. The samples are usually standard 12.7 mm round aluminum stubs with carbon tabs. The sticky carbon tabs are used to collect a sample from the hands of a suspect, carbon coated and then loaded into the SEM. The challenge is now to locate particles that are consistent with gunshot residue amongst all the other stuff there might be on the sample. The criteria are that the particle has to contain antimony, barium and lead, at least for traditional gunpowder. Lead free gunpowder is available but it is significantly more expensive and when asking how often it is seen in the labs, I was told that apparently the criminal element is price conscious and not particularly environmentally friendly! The big challenge with GSR is that the software has to search through the entire stub, separate carbon tape from particles down to less than 1 micron, and then investigate whether a particle is consistent with GSR based on the composition. The workflow is illustrated in Figure 3 and is done by collecting high resolution images, looking for particles based on greyscale value in the image, collecting a spectrum from each particle and then classifying the particle based on composition. Once the data is collected, the user can go in and review the total number of particles and specifically look for GSR particles, relocate them on the sample, and collect high resolution images and spectra for documentation in a potential trial. 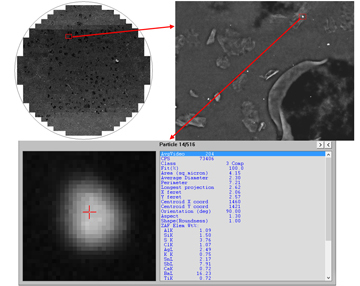 Figure 3: Overview showing the fields collected from the full sample stub (top left), zoomed image corresponding to the red square in the overview image (top right) and gunshot residue particle from the red square in the zoomed image (bottom). Three weeks, three very different applications and a very long answer to the question of what kind of samples and applications I typically see. Each of these three applications is typical in its own way although they have little in common. This brings us to the bottom line: most of the samples and applications we come by might be based in the same technique but often the specifics are unique and I guess the uniqueness is really what is typical. An interesting post. I really enjoyed reading.